After trying DIY chalk paint for the first time and loving how easily it is to work with, I was ready to take on a project that was a little bit larger than the stenciled piece. But, I wasn't ready to use it on any furniture pieces I already own, so I made a trip to the local Goodwill Store. There was not a lot to choose from that day, but for $5.00 I found this piece that seemed like it could be a great test piece. I'm not exactly sure what the original use for this piece was. Based on the size of the shelves, I'm guessing it was a CD rack. Even though it was filthy, the original label from Pier One was still on the back of it. They make those labels to last! It was so dirty, I almost decided against it, but I really wanted to find something there that day and it was this or nothing. After cleaning it, which took a while, I managed to get it looking like this. Much better! I sanded it down a little before painting. I used the same mixture for chalk paint that I used for my stenciled piece. For the recipe and to see lots of pieces that have been redone with it, visit 2 Bees in a Pod. Be prepared to spend a while there- so many great things to see! I used two coats of chalk paint to make sure I had smooth coverage. After the paint dried, I lightly sanded the edges. I didn't want a bold distressed look, just a little. I made sure to wipe away all the dust from sanding and then used a polycrylic spray sealer. I did some research about using this on top of chalk paint instead of wax and I found that it works well. There are advantages and disadvantages in using wax, so I decided for this piece, polycrylic would work just fine, plus it's tons easier than using wax. It gives a different look, so it just depends upon what you're going for. I used Mini Wax Gloss Polycrylic Protective Finish. 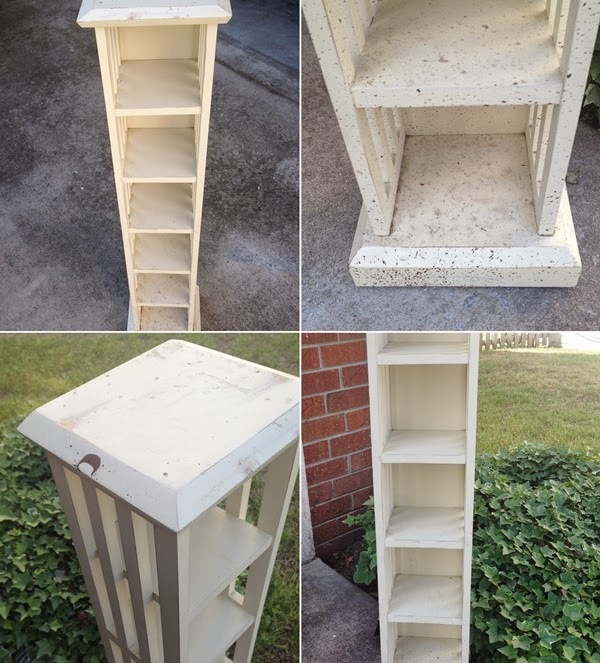 I knew when I saw this (after I got over how dirty it was) that I wanted to use it as a plant stand and as a display shelf for a few coastal decor pieces. It's now positioned in my breakfast nook and I'm pretty pleased with it. I want to take a minute to show off this lovely stained glass sea shell. Gloria's husband, Matthew, made this for me! I love it! The basket was looking a little plain, so I tied a green burlap bow around it to set it off more. The next time I'm in a thrift store, I'm definitely going to pay more attention to the less than appealing pieces of furniture there. 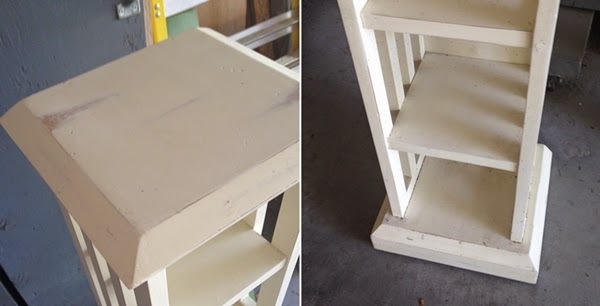 I'm going to continue working my way up to using chalk paint on a nicer piece of furniture. It's amazing what some cleaning and painting can do! 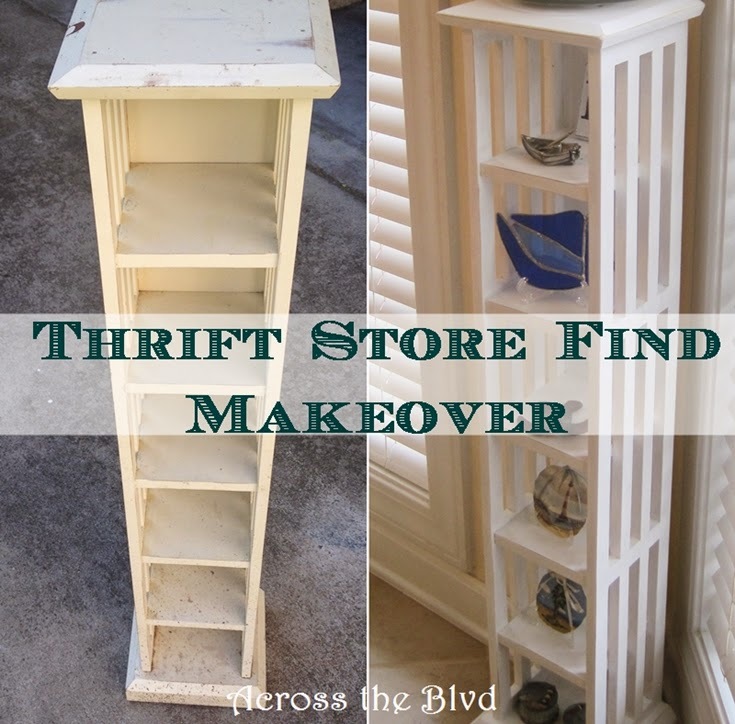 What's your last great thrift store find? Great Job Beverly! I have to admit that I would have probably passed over that piece - so amazing what a good cleaning can do! I'll think twice now! The finish looks great and you styled it beautifully! I can't wait to see your next chalk paint project! I haven't done any research yet about the pros and cons of wax - which is one of the things that has held me back from attempting the piece I'd like to do. I'm intrigued by the finish you used. I'll have to look into that before I take the plunge! Can't get over that $5 price tag either! The stained glass shell that Mathew made is awesome! He does such beautiful work! I'm so glad that you shared it too! Thanks! I know-it was very nasty. But spending time to clean and paint it was worth the effort. For this piece, I think the spray sealer was just fine. I've got an old chest of drawers that I'm thinking of chalk painting and for that, I may want to use the wax. I'm going to do some more researching before I take on that project. I'm sure Matthew will be delighted to hear that! Hope your week is a great one, too. YAY Beverly! You did a great job with your new plant stand...we are so proud of you! So glad you're using our chalk paint recipe and that you're finding it easy to work with! Matthew deserves a shout out too. Love the stained glass shell! Thanks, Vicki! I'm just so pleased with your chalk paint recipe and I'm happy to have found your blog! Frankly, I'm not sure why anyone spends the money for some of the major brand name chalk paint! I'll pass along your compliment to Matthew! It fits beautifully! I totally agree with the light distressing. I don't understand the finishes that look like the furniture was dragged from a truck through a gravel pit. I have been doing a lot of research about furiture painting lately so I hung on to every word and tip, lol. Hi Sharon. This particular project was really easy! Sometimes we just have to take the plunge and give it a try. That's why I'm starting with thrift store finds and not any pieces I already own! Thanks for visiting! Thank you! I'm just now dipping my brushes in! I'm learning as I go. I'm happy to share what I've learned! Thank you, Katie! I was happy that I could find a home for it! Hi Rachel, thank you! I'm laughing at your description. Sometimes that is exactly what it looks like! That look just doesn't fit in with my decor. I've been doing a bunch of research, too. There is so much information out there! Thanks for stopping by. This turned out to be a great piece. I love how you lightly detailed it. And the glass sea shell is lovely. Thank you, Trish! I'll pass along your compliment to Matthew, too! Thanks for visiting. Just poping over from Brag About It to thank you for linking up with us and to let you know that your post will be featured on next weeks party! Party starts Monday at Midnight! Oh wow, thanks so much, Laurie! You are very welcome! You did a great job on your makeover!